Politics on THE ENVIRONMENTALIST: Does the $1 Trillion Key to Winning the Afghan War Lie Under the Sand? Does the $1 Trillion Key to Winning the Afghan War Lie Under the Sand? The Obama Administration has lately been hungry for some good news from Afghanistan. President Obama's base who strongly supported his stated plan during the campaign to renew U.S. efforts in Afghanistan has abandoned him, significantly shortening the amount of time he has to succeed. Meanwhile, the Taliban seem to continue to be fighting aggressively in many areas, especially the South East, despite the fact that they have lost half of their entire top leadership since the beginning of the current U.S. Administration. President Obama not only may have gotten a break, but he may have found the biggest single solution to permanently transforming Afghanistan's economy and winning the struggle against Taliban. A small group of Pentagon and USAID officials and American geologists have discovered vast deposits of untapped mineral substances in Afghanistan, consisting of iron, copper, cobalt, gold and industrial metals such as lithium. The value of these previously unknown deposits is estimated at $1 trillion dollars. The discovery can be a significant component in Obama's strategy in Afghanistan. The current Afghan economy almost exclusively relies on opium. 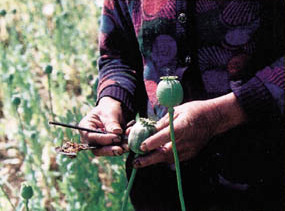 Not only Afghan farmers grow poppy flowers from which poppy seeds are extracted, but bathtub laboratories in unstable areas along the Af-Pak border region convert opium into morphine and other opiates and use a sophisticated and international network of merchants and corrupt public officials in neighboring areas for global distribution. In Seeds of Terror, ABC News journalist Gretchen Peters explores the way in which this narco-state's exports undermine global efforts against drugs and how for years Taliban warlords have directly controlled the Afghan opium industry; using proceeds from taxation at every step of the production process to bring in as much as $500 million a year by some estimates to finance their oppression at home and international terrorism campaigns abroad. Despite all of these realities, the U.S. and Afghan governments have chosen to not fight as aggressively as they could to eliminate poppy fields because they understand that virtually all the opium farmers grow the seed because there is virtually no national economy that would create other job opportunities, and other crops only yield a fraction of the profits. But the new discovery of minerals has the potential to significantly alter the options for Afghans. The amounts of the discovered deposits are significant, having the ability--as one U.S. official has said--to turn Afghanistan into the Saudi Arabia of lithium, a silver-white material that is used in just about every arena of science and medicine, from lithium-ion batteries and as a neutron absorber in nuclear fusion to lithium salts such as lithium carbonate, citrate and orotate (mood stabilizers that are used to treat bipoloar disorders, and sometimes Posttraumatic Stress Disorder (PTSD), which brings us full circle back to the Afghan War). Americans often ask, what would "victory" in Afghanistan look like? It looks like this: An Afghan government that is democratic and strong and can provide its citizens both a safe environment in which they can pursue their dreams without the threat of medieval Islamic radicals, warlords and Mujahedin leftovers, and an economy in which they can work and prosper in sustainable ways and positively contribute to national and global welfare. In order to achieve this goal, a number of things need to happen. The first one is creating a little space for development and education. That is why President Obama was absolutely right in temporarily sending more troops to Afghanistan last fall. The next step would be to use the newly available safe space to support, train, and strengthen the lesser of the two evils--i.e. Karzai and the Afghan government--to maintain security. As soon as we begin seeing signs of success at these two levels--which we already have--the global community must begin an aggressive development effort to help Afghans build both the physical and cultural infrastructure for success. It is this step and not the temporary military defeat of the Taliban that has and will continue to pose the biggest challenge to Afghans, Americans and other NATO countries. The Obama Administration understands that Afghanistan will never have the kind of sustainable and democratic government that could prevent it from becoming a safe haven for terrorists if the vast majority of its farmers continue to produce a product that is illegal to use in most countries. There is no way in which the Afghan government--whether under Hamid Karzai or any other president, democratic or not--could attain global legitimacy and respect if Afghanistan is to remain a narco-state. But the reason why the Afghan government and global community has been unwilling to forcefully eliminate poppy fields is that Afghan farmers have simply had no other choices. Unlike most countries, Afghanistan simply does not have a national economy that is integrated within the legitimate international trade system and would allow Afghans to take their share of global prosperity. Western forces have been reluctant to take away Afghans' only source of income, because that could lead many of them to join the Taliban for a pay-check. This discovery of these large deposits of highly desirable minerals can potentially be Afghanistan's way out of these grim choices. The exploration and distribution of these deposits in the global economy offer Afghans opportunities for livelihood at every step. The process of establishing a modern mining infrastructure and accessing these untapped resources can create hundreds of thousands of jobs for Afghans with every level of education, from illiterates to engineers. Some experts are predicting this step alone to take 5 to 10 years. Throughout this process, Afghanistan can make the transition to a mining capital of the world. It has the potential to provide highly valuable commodities for the world economy for generations, pulling Afghans out of poverty and allowing the government to build education and transportation infrastructure. But as with any valuable discovery, there are some caveats. The first obvious one is that there may be more minerals under the sand, but there is no less corruption over it in the Karzai government. The U.S. should absolutely not use this exploration in any way to shorten its commitment. In fact, the discovery only highlights the importance of U.S. presence to help Afghanistan develop a transparent, democratic and fair way of reaping the benefits of these resources. This means holding tall Afghan governments' feet to the fire at every step. The U.S. must also watch out for the Taliban, who have previously used Afghanistan's poppy economy to fund their terrorism and will not hesitate to get control of these natural resources for the same purpose. Thirdly, such an effort to create a mining industry on a national scale must be done with utmost care to minimize any permanent negative effects on the environment. There is also always the chance that opportunistic Western corporations like Halliburton will try to take control of and virtually steal these resources from their rightful owners. And finally and perhaps most importantly, it is absolutely critical both for Western powers and Afghans to understand that they should not use the discovery and sales of these minerals as a long-term end in and of itself. This would lead Afghans to waste their most important resource in the process the way Saudi Arabia has--their human resources. What Afghans need to understand is that as vast as these resources may seem now, they are limited and fixed. Afghanistan cannot extract and sell these resources without using the prosperity that it will hopefully provide to educate their population and train them for skilled jobs of the twenty-first century. President Hamid Karzai is famous for having won a highly questionable election and running a government that is corrupt and incompetent at many levels. This discovery of minerals is as much an opportunity for Afghans to break out of their conflict and poverty trap as it is for Karzai to create a better record for himself and a better legacy before he leaves office. The United States and President Obama must work with the Pentagon, USAID, scientists and economist from around the world to advise the Afghan government about the best way to tap these resources. Many critics of the administration's policy in Afghanistan are solely focused on corruption in the Afghan government. But besides the fact that those problems must be solved bottom-up and that for now we have no choice but to make lemonade with the lemons we have, rest assured that the more a modernized economy raises Afghans' knowledge about how people in the free world live and their level of access to information technologies, the more Afghans are going to use those tools to self-educate, organize and demand more from their government. This, in the long-run will undoubtedly lead to a truer and much more representative government than what they have today.